The Republic of Equatorial Guinea raised investment prospects in Asia during a busy week of meetings in the region, a historically integral customer of Equatorial Guinea’s liquefied natural gas (LNG). The Ministry of Mines and Hydrocarbons delegation met with several energy companies in Singapore to promote its 2016 oil and gas licensing round. The round will strengthen ties with companies in Asia, a region that accounts for more than 90 percent of Equatorial Guinea’s total oil and gas exports. The Minister of Mines and Hydrocarbons, H.E. Gabriel Mbaga Obiang Lima, highlighted oil and gas opportunities with several companies across the energy value chain, including exploration and production, services and construction, marketing, and trading. The Ministry delegation last week toured the shipyard of Keppel Offshore and Marine, a company responsible for the construction of the Fortuna floating liquefied natural gas project (FLNG). The Government of Equatorial Guinea is negotiating terms with offtakers of the 2.2 million tons per year that the FLNG is expected to produce. “Equatorial Guinea has been responding to the tectonic shifts in market conditions with a long-term strategy that makes us competitive at every level of the energy supply chain. We have a well-established production base of offshore oil and gas assets, more exploration underway and big export projects that will continue to sustain the long and proud trade relationship we enjoy with Asia’s economies,” said the Minister. Economies in Asia are integral to Equatorial Guinea’s LNG development but Europe is expected to emerge as an attractive competitor in the coming years. Equatorial Guinea produces 3.4 million tons per year of LNG. Ambassador to Ethiopia and the African Union highlights sophisticated conference facilities, hotel sector and logistical preparation in meeting with Arab and African leaders. Equatorial Guinea is moving forward with logistical arrangements for the Africa-Arab World Summit to be held in Equatorial Guinea in November and expects a successful conference, said Simeon Oyono Esono, Ambassador of the Republic of Equatorial Guinea to Ethiopia and the African Union. Ambassador Oyono Esono briefed African and Arab-state representatives during the Ministerial Meeting of the Africa-Arab World Partnership Committee September 24. “The Government of Equatorial Guinea has made a strong commitment for the success of the Africa-Arab World Summit by ensuring the effectiveness of management in the logistic field as well as towards the administrative facilities, in accordance with the Headquarters Agreement, whose signature between the parties will take place in the coming weeks,” he said. President of the Republic of Equatorial Guinea, is personally committed to the success of the summit and was honored that the African Union had entrusted Equatorial Guinea with host responsibilities. Ambassador Oyono Esono highlighted the country’s strong infrastructure supporting important international meetings, including the large and sophisticated conference center in Sipopo, which includes villas appropriate for lodging heads of state and their staffs and a large and modern hotel sector that meets all international standards. He said that local transportation and security had been areas of particular focus in the government’s planning. “We believe undeniably that this high-level Summit will progress in conditions that will really bring out the characteristic hospitality of the African people and the people of Equatorial Guinea,” he said. Equatorial Guinea’s Minister of Foreign Affairs and Cooperation, Agapito Mba Mokuy and Permanent Representative of Equatorial Guinea to the United Nations, Anatolio Ndong Mba and all other members of the Equatorial Guinea delegation were also at the meeting. Equatorial Guinea donates to FAO, WHO, and UNESCO as Horizon 2020 makes great strides. Equatorial Guinea has prioritized economic and social transformation through human capital development and inclusive and sustainable growth, which aligns with the country’s Horizon 2020 Development Program, said Agapito Mba Mokuy, Equatorial Guinea’s Minister of Foreign Affairs and Cooperation, at the United Nations General Assembly. Minister Mba Mokuy outlined the four priorities of Horizon 2020, including developing modern infrastructure; strengthening human capital and improving the quality of life for every citizen; diversifying the economy with support from the private sector; and good governance. The program has made significant progress since implementation last year, including major reductions in the risk of maternal and infant mortality; free health service and drugs for youth and the elderly; the development of agriculture and hydrocarbons to create more jobs; the implementation of progressive gender equality policies; and electricity and sanitation for all citizens. Mba Mokuy also noted that Equatorial Guinea has donated $30 million XAF to the Food and Agriculture Organization (FAO) to fight hunger on the African continent, $2 million and $36 million to the World Health Organization (WHO) to fight Ebola and research the Malaria vaccine, respectively, and $3 million to United Nations Educational, Scientific and Cultural Organization (UNESCO) to combat endemic diseases such as Ebola, Malaria, and Tuberculosis. Mba Mokuy addressed the 71st Session of the United Nations General Assembly in New York amid a busy series of meetings for Equatorial Guinea, including the UN Summit for Refugees and Migrants, the U.S. Africa Business Forum, and the Community of Portuguese Language Countries (CPLP) Foreign Affairs Ministerial meeting. 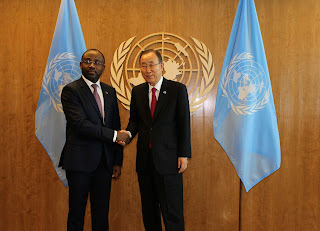 Equatorial Guinea Minister of Foreign Affairs and Cooperation, Agapito Mba Mokuy, who is heading his country’s delegation to the 71st United Nations General Assembly (UNGA), is actively engaged in a busy series of meetings. Minister Mba Mokuy attended the plenary meeting of the United Nations Summit for Refugees and Migrants, a meeting convened at the head-of-government level aimed at addressing the problem of large movements of refugees and migrants and strengthening governance of international migration. It served as an opportunity to create a more responsible, predictable system for responding to large movements of refugees and migrants. Minister Mba Mokuy also joined African Heads of State at the second U.S. Africa Business Forum, co-hosted by Bloomberg Philanthropies and the U.S. Department of Commerce. Equatorial Guinea is in the midst of an ambitious plan to diversify its economy by expanding in particular the agriculture, fisheries, mining, finance, telecommunications, manufacturing and petrochemicals sectors. Anatolio Ndong Mba, Permanent Representative of Equatorial Guinea to the United Nations, attended a climate change conference. Equatorial Guinea hosts a number of UN programs in its territory, including the United Nations Population Fund (UNFPA), UNICEF, and the UN Development Programme, which has conducted a national census with funding from the government.